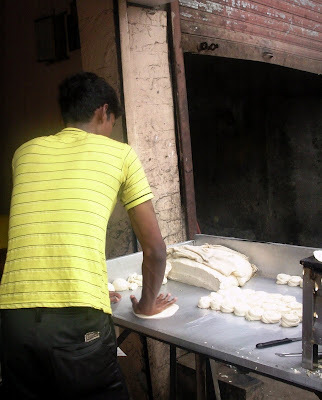 Kneading dough, making rotis, in a dhaba (streetside cafe) in Andheri - a suburb of Mumbai. The speed at which he does it is amazing! Rows of cabs outside the Chhatrapati Shivaji International airport of Mumbai. Elphinstone building near Horniman circle in South Mumbai. Just landed in the Veermata Jijabai Udyan of Mumbai! Twisted beads' strings to from curtains at the entrance of a very popular restaurant in Bandra. 'Tavaa'. The poles that hold up the name board are tied at the bottom and top by twisted jute (rope). Click on the picture to have a closer look. The Mumbai sky as seen on 11Sep09 at 1848hrs. Hey guys you must be tired and thirsty after trawling through bloggerspace. Come, relax, have a drink! Jaffer Bhai's - the yummiest Biryani in Mumbai! 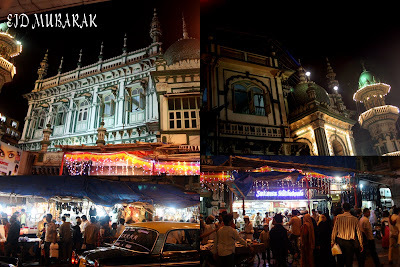 Eid celebrations at Minara Masjid on Mohammed Ali Road in Mumbai. Modern conveniences in an ancient structure in South Mumbai. Crows at the Veermata Jijabai Udyan discussing their strategy to obtain their next meal perhaps? Some cones are upside down at the Chhatrapati Shivaji International Airport of Mumbai! The Mumbai sky as seen on 11Aug09 at 1755hrs. A breath of fresh air on Carter road in Bandra, Mumbai. Ice cream topping on a sizzling chocolate brownie at Pop Tate's a cafe in the food court of a mall in Mulund, a distant suburb of Mumbai which is soon becoming the mall capital of Mumbai. Rotis (Indian bread) being made in the courtyard of Mumbadevi temple, for distribution to the devotees. Mumbai is named after this Goddess 'Mumba aai'. A building around the Horniman circle in South Mumbai. A python resting in the Mumbai zoo. A jumble of Electric wires crisscrossing outside the Mumbadevi temple. The Mumbai sky as seen on 16Aug09 at 1856hrs. Birds in flight at Dadar Chowpatti. The 'Pearl of the Orient' is the only revolving restaurant in Mumbai, with a breathtaking view of the Arabian sea and the Queen's necklace. It offers a wide range of Oriental cuisine (Chinese, Japanese, Thai and Korean). Serves a 3 course set menu for lunch. Otherwise open for lunch and dinner service. The top portion of the Vithoba temple in Mahim, Mumbai. Barking deer at the Veermata Jijabai Udyan in Mumbai. Orange flags fluttering atop Mumbadevi temple. Mumba Devi Temple, is an old Hindu temple in the city of Mumbai (formerly Bombay) dedicated to the goddess Mumbā, the local incarnation of the Devi (Mother Goddess). Marathi Mumbā derives from Sanskrit Mahā-Ambā "Great Mother", and Mumbaī combines the name with aī, the Marathi for "mother". The goddess Mumba was patron of the agri (salt collectors) and kolis (fisherfolk), the original inhabitants of the seven islands of Bombay. It is 6 centuries old. The Mumbai sky as seen on 19Aug09 at 1914hrs.